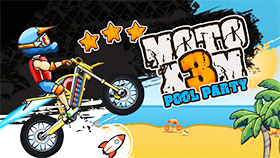 Moto X3M is a very exciting terrain racing The game was developed by Mad Puffers studio and allows players to experience it on flash web. The game has the same graphics as American comics and the gameplay is very attractive. 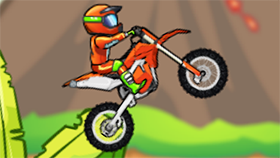 You will play a guy driving a motorbike and trying to overcome the obstacles and reach the destination safely. The game has many stages with different terrain and difficulty increasing. 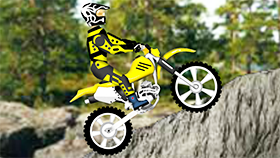 The game challenges players by dangerous obstacles such as huge gears, explosive barrels ... And players need to find a way to overcome them. When the player reaches the destination, the system evaluates the player with stars. There is a maximum of 3 stars per stage and each star will be a timeline, if the players arrives at that time so they will receive the star. The most interesting thing is the unique Flip feature. If the player flips one round, it will be reduced by 0.5s, the more flip the round will be reduced more and more time.